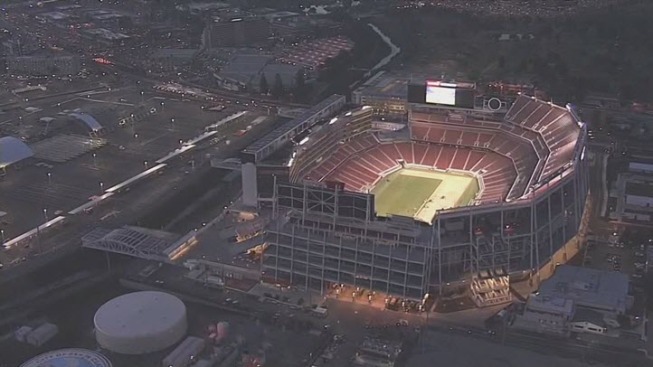 File image of Levi's Stadium in Santa Clara. The relationship between the San Francisco 49ers and the City of Santa Clara continues to sour. The team on Tuesday announced it has filed for arbitration in an ongoing rent dispute with the Santa Clara Stadium Authority. The 49ers want the city to slash the rent for Levi's Stadium. The billion-dollar stadium that opened in 2014 is a public-private partnership. The team had been paying the city $24.5 million per year in rent. The 49ers have proposed a new rent of $19 million a year, citing better than expected stadium revenue that allows them — the agreement with the stadium authority — to renegotiate the rent to a lesser amount. Both sides are not budging on rent negotiations, which prompted the 49ers to send the case to arbitration.